Krsna naturally has His own personal identity, just as each of us does. Personhood is not a limited concept when applied to God, or the Absolute Truth. The Vedas, (scriptures of ancient India) define Krsna as the supreme conscious being among all other conscious beings. He is infinite, we are finite. He is ultimately responsible for the creation, maintenance, and annihilation of everything in the material world. Any descriptions of the Supreme Being may seem incredible unless we consider that the ultimate source of everything, the Absolute Truth, the Supreme Person, God, is also the origin of all forms. Our forms in the material world are temporary, changeable, and often causes of misery, but the Absolute Truth is eternal, unchanging, and blissful. Krsna is always a person. The Supreme Person is the archetype of all forms—His form is most beautiful of all—and by practicing Krsna consciousness we can become qualified to see Krsna for ourselves, face to face. Krsna is the speaker of the Bhagavad-gita, recognized throughout the world as one of mankind’s greatest books of wisdom. In the Gita, as it is also known, Krsna says repeatedly that He is God Himself, the source of everything. He also explains how anyone can know Him through Krsna consciousness, bhakti-yoga. Naturally, the best way to understand God is to learn from Him. 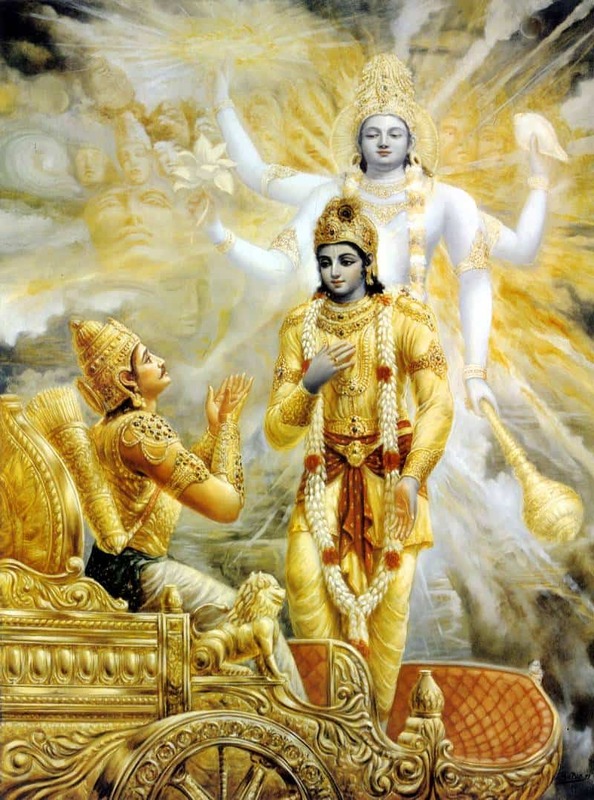 In the Bhagavad-gita (“The Song of God”), Lord Krsna—a real, transcendental person—tells us that He is God and reveals many things about Himself. Understanding that God is spiritual, people sometimes conceive of Him as having no qualities. But although Krsna has no material qualities, He is full of unlimited transcendental qualities, and those qualities attract us to Him. Thus, great souls who have given up everything cannot give up attraction to Krsna, and they dedicate their lives to finding Him. What Does Krsna Look Like? The Srimad-Bhagavatam describes Krsna’s uncommon and fascinating personality and activities in its Tenth Canto. In His pastimes as a small child, He captivates the minds of the residents of Vrindavan with His charming, naughty behavior, such as stealing butter. In His youth, He captures the hearts of the gopis by His irresistible beauty, charm, and flute playing. Vedic writings say that Krsna has a stunningly beautiful spiritual form (Krsna means “all-attractive”). His feet are decorated with auspicious symbols, His voice is like rumbling thunder, and a unique gem—Kaustubha—hangs around His neck, along with a garland of ever-fresh flowers, attracting bees humming Vedic hymns. Other accounts say that Krsna’s enchanting smile is irresistible, as are His attractively moving eyebrows. His clothing is compared to lightning. His wide eyes, delicate hands, reddish-soled feet, and His deep navel often draw comparisons to the beauty of lotus flowers. The luster of His dazzling toenails is compared to moonlight, and He always appears in the fullness of youth. The Vedas tell us that spirit is composed of eternity, knowledge (or consciousness), and happiness. Both God and we souls possess spiritual forms, which are free of the limitations of material form. For example, each part of a spiritual body can perform the function of any other part. Krsna’s body never changes; He is an eternal youth. Unlike us ordinary souls, who may possess a material body, Krsna and His body are always identical. The names can be generic terms, such as “God” or “the Absolute Truth.” They can be in Sanskrit, such as Govinda, Gopala, or Shyamasundara. They can also be in other languages, such as Yahweh and Allah. The name Krsna, which means “the all-attractive One,” implies that each of us has an eternal relationship with God and we are always drawn either to Him directly or to His energies. One of Krsna’s names is Adhokshaja, He who is beyond the material senses. It’s easy for us to see matter. The Supreme Person is 100% spiritual, and we need spiritual vision to be able to see Him. Krsna says in the Bhagavad-gita that He keeps a curtain of illusion (maya) between Himself and those who have no affection for Him. What Is Krsna’s Personality Like? Krsna is loving by nature. In our original pure state, we love Him fully. In the exchange of complete love, Krsna considers His devotees greater than Himself. In the spiritual world He always stays with His devotees, and in this world, He resides in every heart as the Supersoul. He wants His children in the material world to return to Him to enjoy with Him eternally. Krsna is completely independent, and we cannot comprehend Him completely. He cannot be conquered by knowledge. But He can be conquered—and seen directly—through pure love. God has feelings: He is satisfied when someone offers Him a nice prayer. Even though He is great, He can be moved by our love. He responds to us according to how we approach Him. The following qualities are considered especially attractive, and Krsna possesses them in full: beauty, wealth, fame, influence, knowledge, and renunciation. Being God, Krsna has innumerable qualities, and seemingly contradictory qualities are resolved in Him. Hearing of how Krsna shows these qualities can give us a sense of His greatness and of His power to attract all souls. What Does Krsna Like to Do? While Krsna’s expansions and incarnations perform duties in the material and spiritual worlds, He Himself simply enjoys with His most intimate devotees in His transcendental home, known as Goloka. By His desire, His associates there don’t even consider Him God. They enhance His enjoyment in five loving moods: neutrality, servitude, friendship, parental affection, and conjugal love. In other words, Krsna’s life is filled with unending bliss in the company of His associates. Krsna enjoys Himself with abandon, frolicking as a youth in expansive fields and forests with His friends and cows. He dances, He plays His flute, He relishes whatever activity strikes His fancy at the moment. To entice souls in the material world to join Him in Goloka, Krsna comes to this world periodically, as He did 5,000 years ago, and shows His confidential, intimate loving exchanges with His ever-liberated devotees. What Are Krsna’s Relationships Like? Krsna savors diversity from various kinds of pure, transcendental love. As we enjoy a variety of relationships in our families and society, so does Krsna, but all of His relationships are eternal, transcendental, and completely free of material contamination. Each of Krsna’s devotees interacts with Him in one of five primary relationships. In ascending order of intimacy, these five are neutrality, servitude, friendship, parental affection, and conjugal love. Each includes the primary sentiments of the ones before it, and then adds its own flavor. Pure love of God reaches its summit in romantic exchanges with Krsna. Devotees in the mood of neutrality witness and support Krsna’s pastimes by their presence as plants, animals, streams, and so on, as well as normally inanimate objects like houses—all of which are fully conscious in Goloka. Devotees in the service mood run errands for Krsna, pack His lunch, wash His clothes, and perform other demonstrations of love for Him as the moment indicates. Devotees in the fraternal mood serve Krsna by being His friends. They are sometimes boastful, considering themselves equal to Krsna. In His company, they herd cows and enjoy games in the beautiful country setting. Devotees in the parental mood see themselves as Krsna’s provider and protector. Krsna behaves with them like a dependent child. His mother cuddles Him, carefully prepares His meals, and thinks only of His protection. His father sees that He has all the comforts of a normal home. Devotees in the conjugal, or romantic, mood offer service as Krsna’s girlfriends, relating with Him in the intimacy of lover and beloved. What is Krsna’s Energy Like? Although Krsna is invisible to us in our present state, we can perceive His presence through His energies, which are everywhere. Although innumerable, His energies fall into three primary categories. Krsna’s internal energy expands as the spiritual world in all its variety, including His ever-liberated associates there. The internal energy is eternal and full of knowledge and happiness. Presently beyond our perception, the spiritual world makes up most of reality. Krsna’s external energy consists of all that is matter: the material world, the laws of material nature, material bodies, and so on. The external energy is temporary and full of ignorance and suffering. It is inert by nature and must be moved by spirit. The material world is a tiny fraction of God’s creation. We finite spirit souls are expansions of Krsna’s marginal energy. We can choose to live in the spiritual world or the material world. Or, to put it another way, we can be deluded by matter or illuminated by spirit. Both the external energy (matter) and the marginal energy (we souls) can become fully spiritualized by contact with the internal energy through acts of devotion to Krsna (Bhakti-yoga). What is Krsna’s Home Like? God owns everything, so in a sense His home is everywhere. But He Himself resides in the spiritual world in a place known as Goloka, the highest spiritual region. Reaching Krsna there is the highest achievement of human life. Goloka is self-illuminated, and everyone there is liberated, shining with pure love for Krsna. Because Krsna is the center of everyone’s heart, there is complete unity and peace. Goloka is built of transcendental gems that yield whatever one wants. The natural surroundings are beautiful, full of diversity and opulence. In Goloka, every word is a song, every step a dance, every moment new, fresh, and exciting. How Does Krsna Become Active Within This World? Krsna’s names, as in the Hare Krsna maha-mantra, are also considered one of His primary avatars. With philosophical insight, we can even see God in the apparently bad things that happen to us. By constitution, we souls can be fully satisfied and happy only when we’re united with Krsna. He sends the miseries of this world so that we’ll realize that we don’t belong here. And His scriptures and representatives help us to see our suffering here as God’s mercy on us.